As our membership changes, so has the face of State Bar leadership and volunteers. There is room within the organization for every member's participation and leadership. Several times each year I have the honor of greeting new State Bar of Wisconsin members at a celebration held following the Wisconsin Supreme Court’s admissions ceremony. What I have found striking at these events is that you can truly see the changing face of the profession and the State Bar. The profession of law in Wisconsin is increasingly reflecting the growing diversity across our state. More people of color, as well as women and individuals with different physical abilities, are becoming our members. While progress is slow, we are inching toward becoming more of a reflection of the communities we serve. As our membership changes, so has the face of State Bar leadership and volunteers. You can see it in the individuals serving on our committees and boards. Things look and feel very different than when I first came to the State Bar nearly eight years ago. Today, there are more women than men on the State Bar Board of Governors. It is younger and has more diverse voices, including political voices from across the spectrum – conservative, liberal, libertarian, and everything in between. This is as it should be. We are not a monolithic organization but one that represents the diversity of philosophies as well as other attributes of our membership. To be a true reflection, we must continuously strive to listen to and honor a broad range of viewpoints and opinions. Some might argue the progress we have made is simply a reflection of the changing demographics of society itself. I don’t think so. Experience has shown that advances on matters of diversity and inclusion tend not to happen on their own. Good intentions alone do not move the proverbial ball forward. It is the work of countless leaders and groups within the State Bar that has begun to move us in a positive direction toward a more diverse and inclusive organization. But before we give ourselves too much of a pat on the back, much remains to be done. While strides have been made, we have a long way to go in making best use of the time and talents a diverse membership offers. 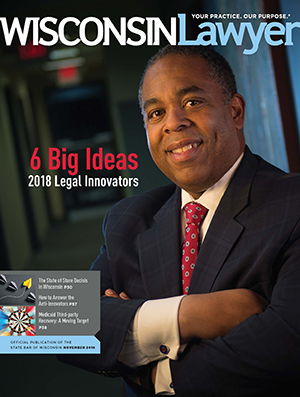 It is the work of countless leaders and groups within the State Bar that have begun to move us in a positive direction toward a more diverse and inclusive organization. We must continue to be not only intentional but also deliberate in our efforts. A workgroup appointed by President Chris Rogers and led by President-elect Jill Kastner has made a series of recommendations that challenge us to keep moving forward. The report focuses on ways we can attract, retain, and engage a diverse group of leaders, volunteers, staff, and community partners: 1) build cultural competencies so that the State Bar is viewed as open and welcoming; 2) increase the representation of a broad range of perspectives in State Bar programming, content, and images that reflect the diversity of the profession; and 3) work to attract new voices in the legal profession and the judiciary. I am eager to move these proposals forward. In the end, being committed to diversity and inclusion is more than changing the faces in a meeting or on a board. It is working to ensure that no one is excluded from being able to fully contribute, lead, and benefit from all our organization has to offer. We’ve taken the first steps. Now let us continue this journey together.